« Here are the caterpillars and milkweed bugs! Well, we’re down to four ducklings now, as one apparently flew the coop (or rather the pond) last night. So we now have on hand (or rather on wing) Honey, who is temporarily flightless because of her molt, and four of the eight ducklings, including the small one who is bullied, Phoebe. But first let’s hand it to Honey for having now fledged eight ducklings in the last year. With luck it will be an even dozen. The good news is that Phoebe appears to be coming out of her cowering state a bit, and looks pretty good. While the other ducks don’t let her join them, she is swimming about and I was able to give her a good meal this morning. This is in contrast to yesterday, when most of the time she was cowering on the duck island, alone. She’s still emitting heartbreaking quacks from time to time, but I’m hopeful that soon she’ll join the others in the Big Egress. Here she was yesterday. Here’s Honey exercising her wings yesterday. You can see they’re strong, but she lacks flight feathers. Note as well the distinctive mottling of her beak, including the trianglular black mark at the junction of her left upper bill and head: her diagnostic feature. 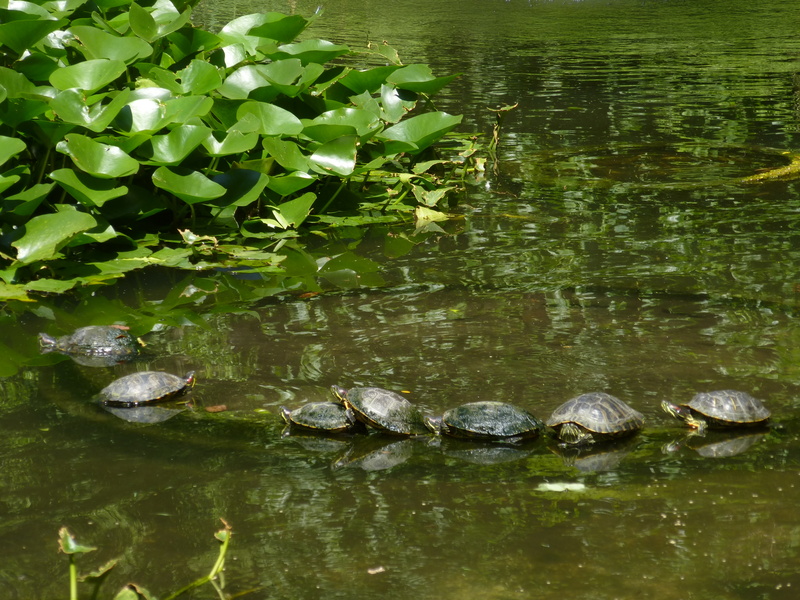 And then they all went nuts, making runs through the pond, diving underwater and swimming a long way (they simply disappeared and reappeared on the other side of the pond. . .
And then they FLEW! 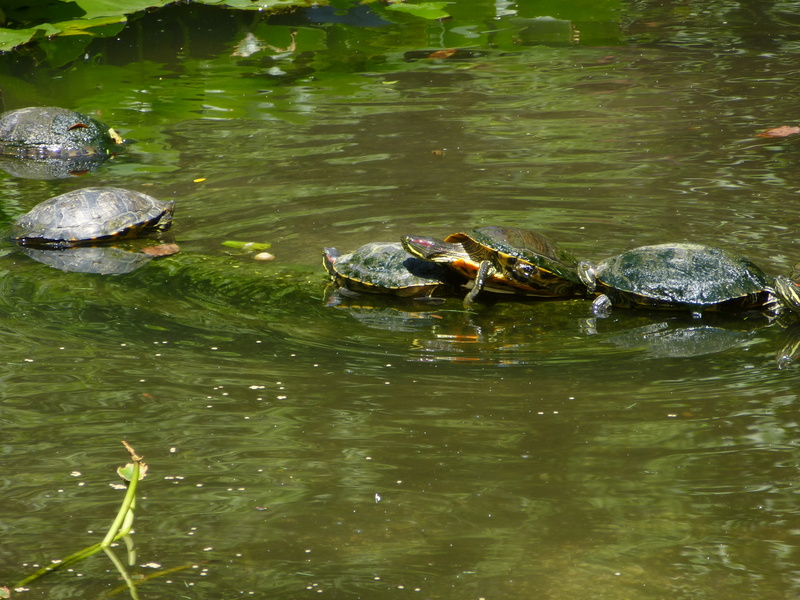 They flew all around the pond but didn’t leave it, making long hops, short hops, and skidding into the water as a landing. All of the flying, racing, and diving went on for about five minutes. 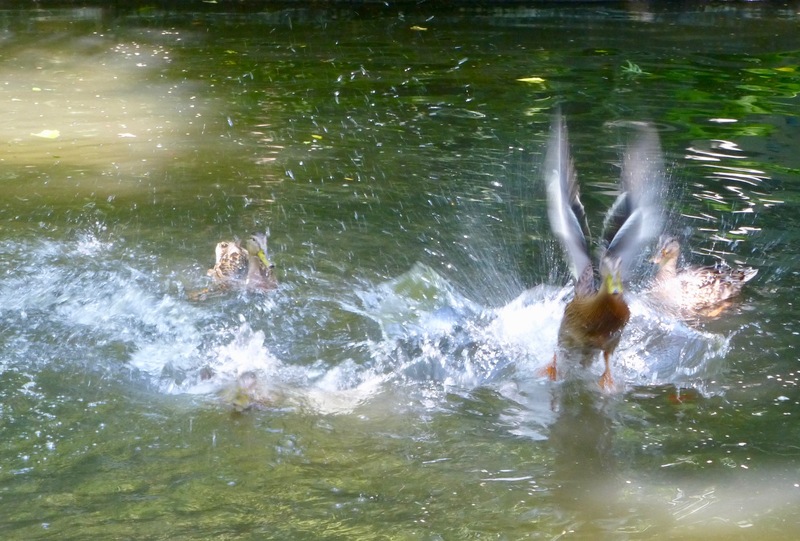 It was the most amazing thing I’ve ever seen: Duck Crazy Hour, a carnival of flight and fun. I wish the video on my camera had been working so you could see it. I was both amazed and elated at the same time. 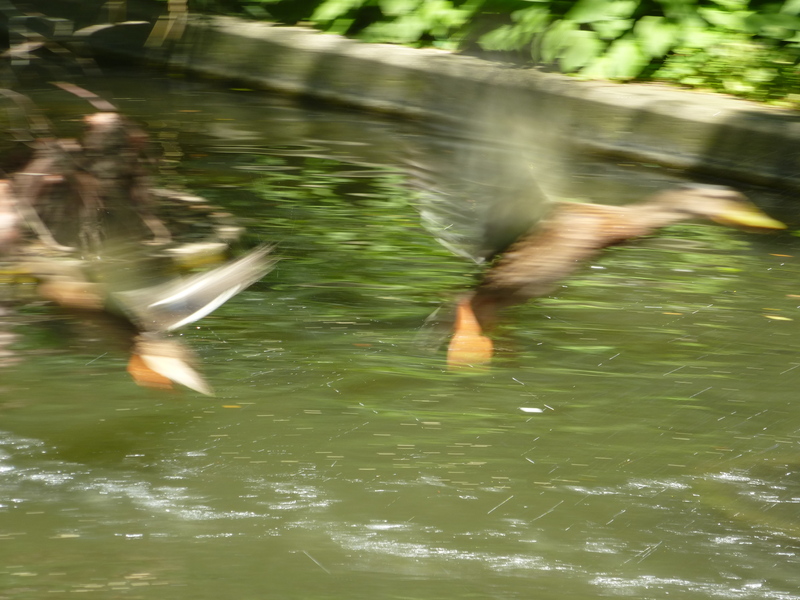 Unlike some species of ducks, mallards don’t need a “run” on the water to take off: they can fly up nearly vertically. That’s what this one is doing in the photo below. Their wings must be quite powerful to lift them off this way. I’m not sure whether they’re testing their wings, practicing flight, or simply having fun. 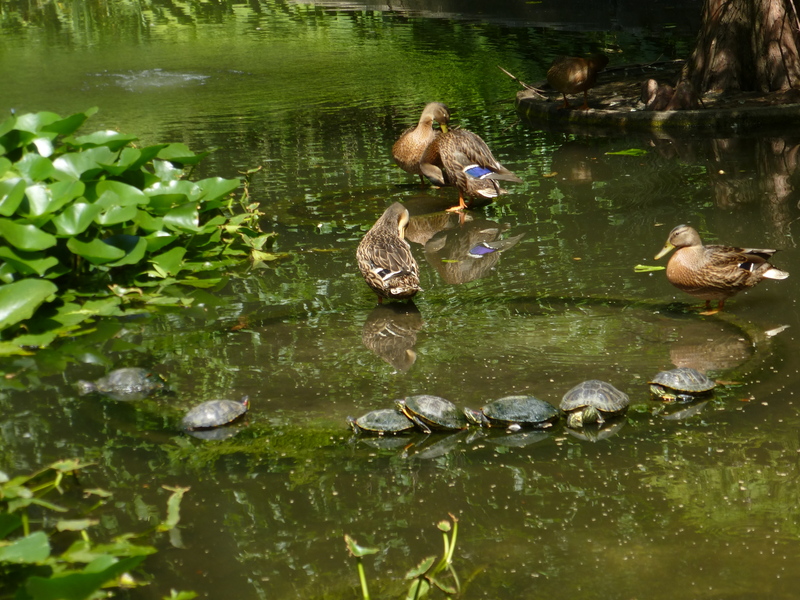 They didn’t leave the pond, but they clearly can, and they flew with great ease. Honey is still being maternal, standing on the cement rings and supervising her brood, even though they’re now pretty independent. I wonder if she has any emotions about their departure? 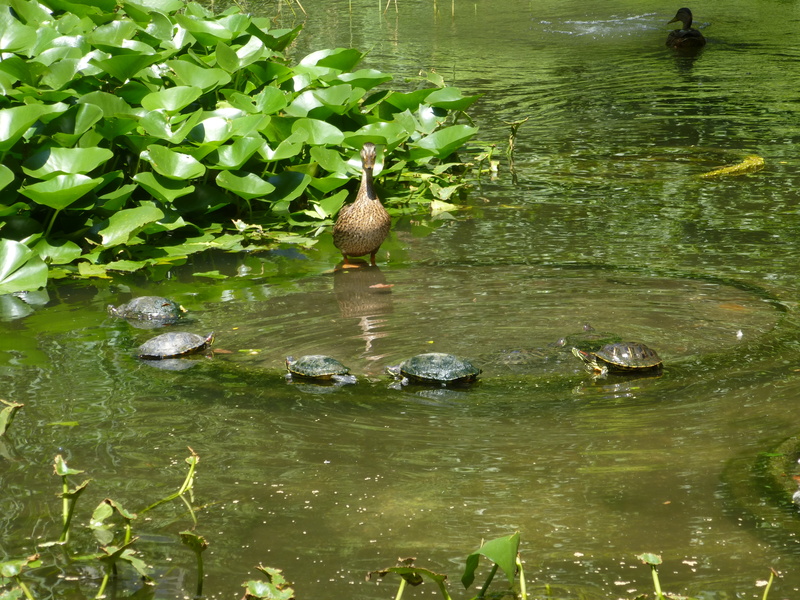 And we mustn’t forget our turtle friends, who are appearing en masse to enjoy the temperate weather and warm sun. Here’s one red-ear climbing atop another one to get the maximum solar exposure. It’s bittersweet to see the ducklings leave one by one (I thought they’d all leave together), but it was inevitable, and I’m really happy that, after the demise of two babies late in May, the rest of them have all survived and thrived (knock on wood for Phoebe!). And I’m happy that Anna and I played a small role in ensuring that they got enough food to give them a good start in life. 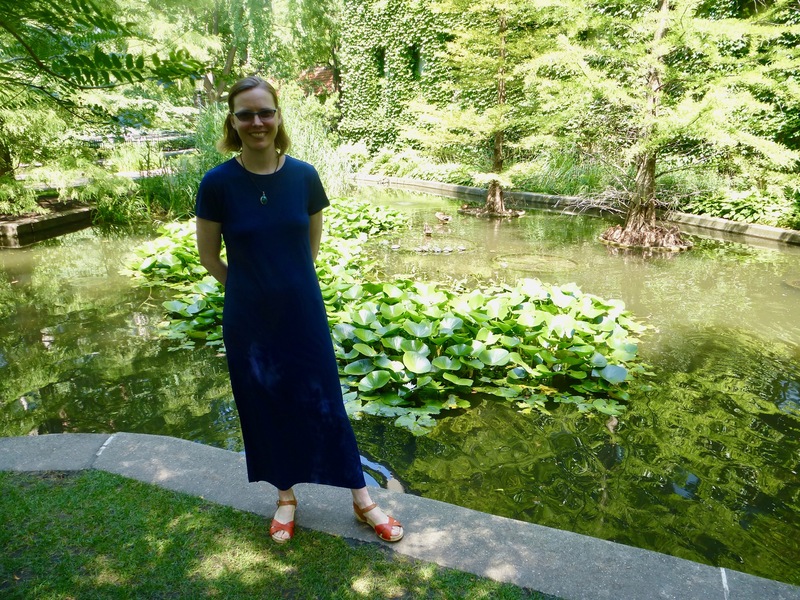 Finally, I know Honey will be here for a while, and I’ll make sure she’s amply rewarded for her hard work in raising a brood of eight in a small pond. Long may they fly! This entry was written by whyevolutionistrue and posted on July 31, 2018 at 1:00 pm and filed under ducklings, ducks. Bookmark the permalink. Follow any comments here with the RSS feed for this post. Both comments and trackbacks are currently closed. I would say a very good outcome all things considered. Out in the more rural surroundings the survival rate is mostly less than this. I guess that is why they have such large hatches. You are probably glad you only go through this once a year. I wonder what happened to the base of the tree. Nothing happened to the base of the tree. It is a member of the cypress family (probably baldcypress, Taxodium distichum). Those “bumps” are characteristic of trees in this family and are called “knees”. As far as I know, it has not yet been determined what the function of those knees is. Thank you. I thought maybe it was something with the water. The knees are so the tree can kneel and pray. They only do it when no-one’s looking. May they live long, prosper, and have many happy landings. In my experience birds quickly forget their fledglings once they’re gone. If you keep them together, as when I raised cockatiels, they will recognise one another as flock-mates but o/w they don’t care. Better the ducklings depart one at a time than to find they flew the coop in one fell swoop. Wait, now how many ducklings did Honey have at first? I thought she started with nine, and one poor baby didn’t make it. Did she have ten and then lose two? 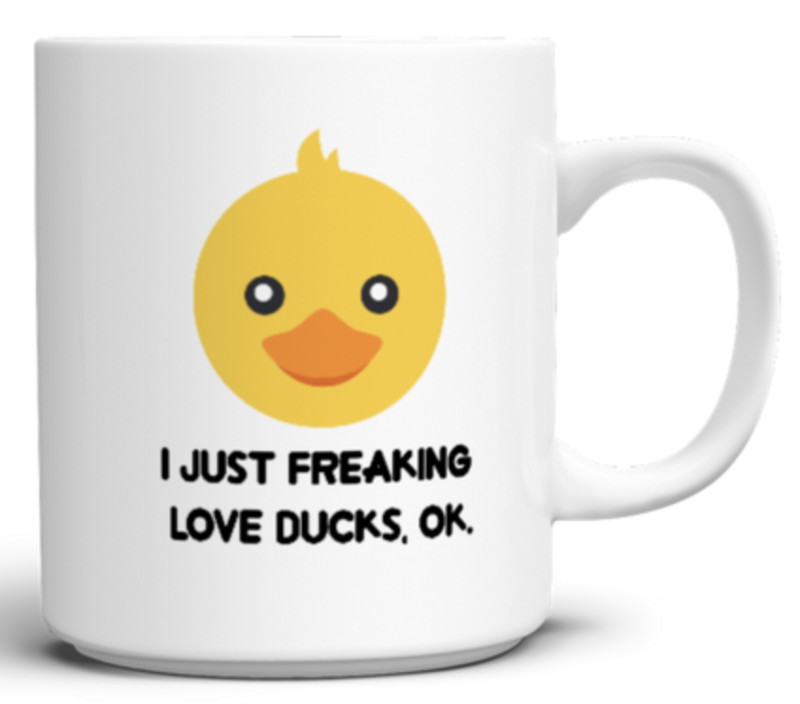 And I like your duck cup! I love ducks, too. We have them in the park just down the street from me, and I feel lucky for that. She had ten. One drowned in the cement “ring” because it got trapped, and another was ill and died in my office. The rest have thrived. 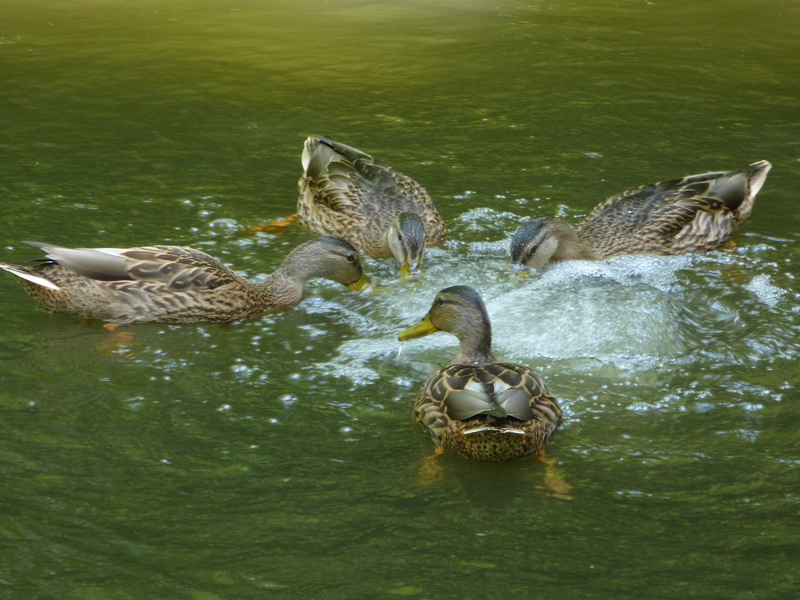 At the beginning of this post, you say that the other juvie ducks won’t let Phoebe join them. 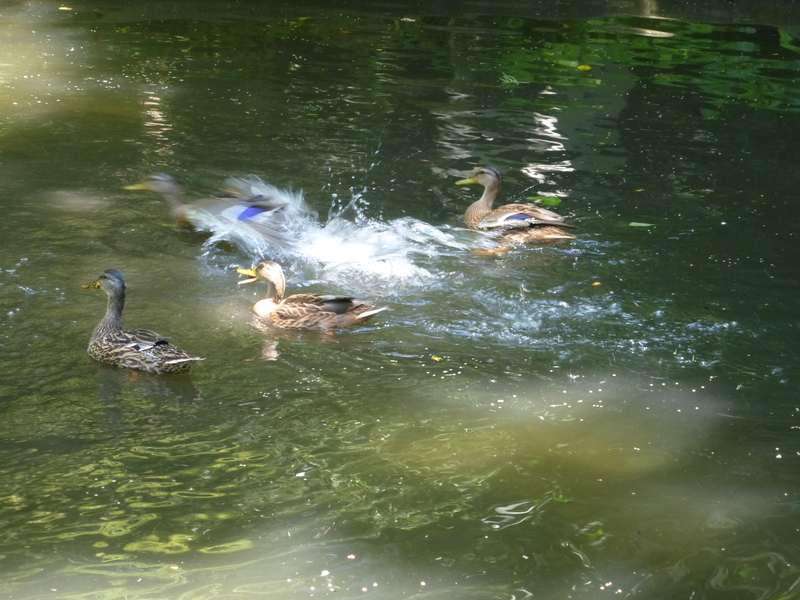 But in the first photo after you described their antics earlier today in the pond, I see four ducks with their flight feathers, and assume one is Phoebe. 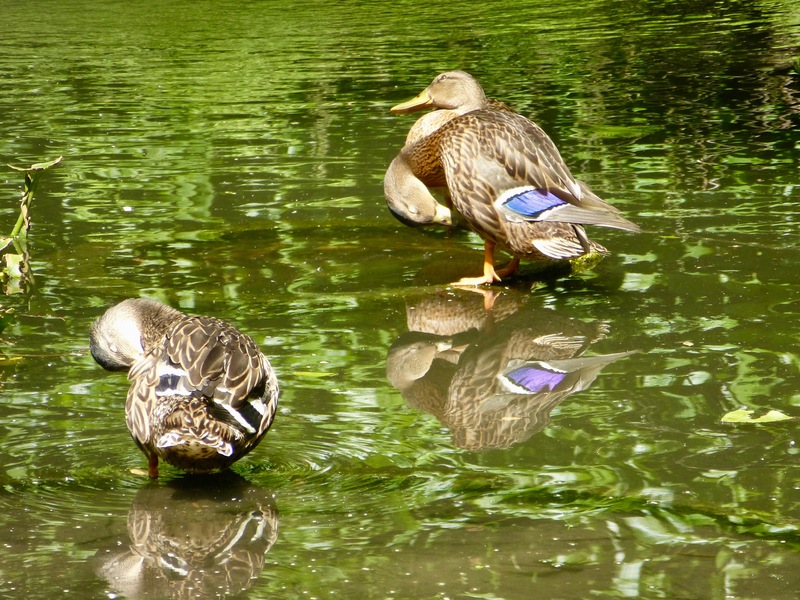 Did she join her siblings disporting themselves in the pond, or did they drive her away? If so, did she do her own thing? That photo was taken yesterday when there were five ducklings (one left last night), so all four of the non-bullied ones were participating. I think animals can feel joyful. Imagine being a duckling, you’re flapping your wings out of instinct, and suddenly you’re airborne, not having experienced that before. PS: I watch goat kids gamboling, and I imagine it’s the same feeling. I don’t think that this is the exact case here, but it may have something to do with it. I’m not sure. If you know someone who does textile silk screening, a full frontal shot of Honey that emphasizes her winsome pear-shaped body, with all the background removed, would make a great T-shirt, with or without a caption. 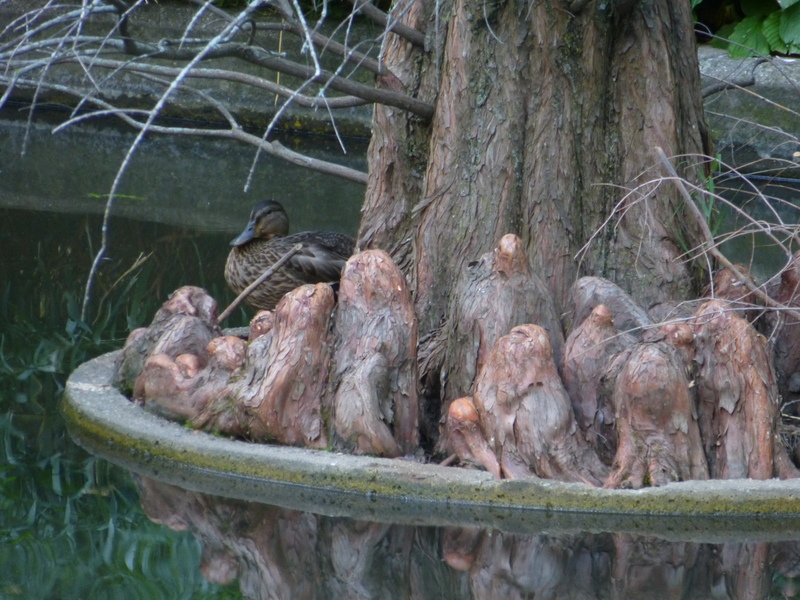 I know I’ve said this before, but I love the duck posts. Kudos to you and Anna for helping Honey give her babies a good start in life. I think this should help Anna when she comes up for tenure – in 2020 I believe. 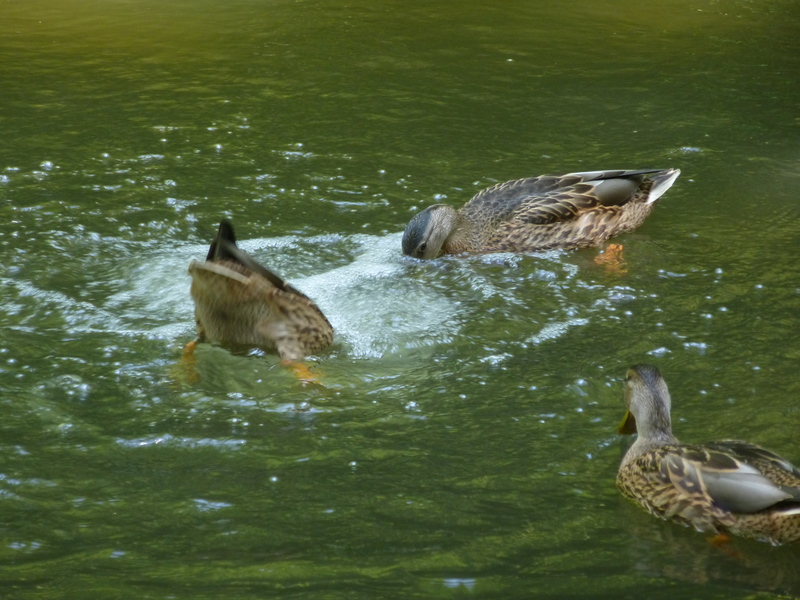 Human development, mallard development – it’s all the same. 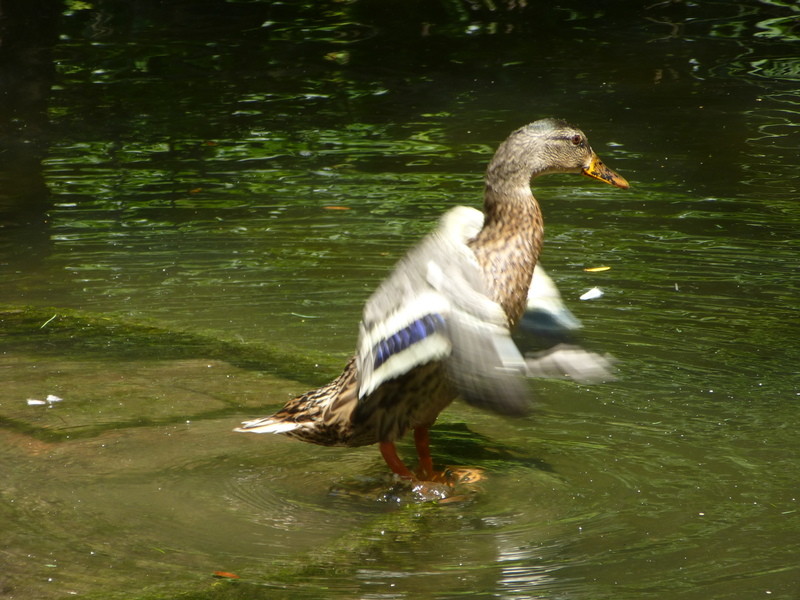 The blue patch on mallard wings seems reminiscent of the red patch on redwing blackbird wings. Are those anatomically the same feathers in each case? If so, and especially if that set often differently colored in other birds, here’s a question for the official ornithologist or to fwd to his molecular geneticist consultant – I wonder what sort of differential control the pigmentation is under at the molecular level? 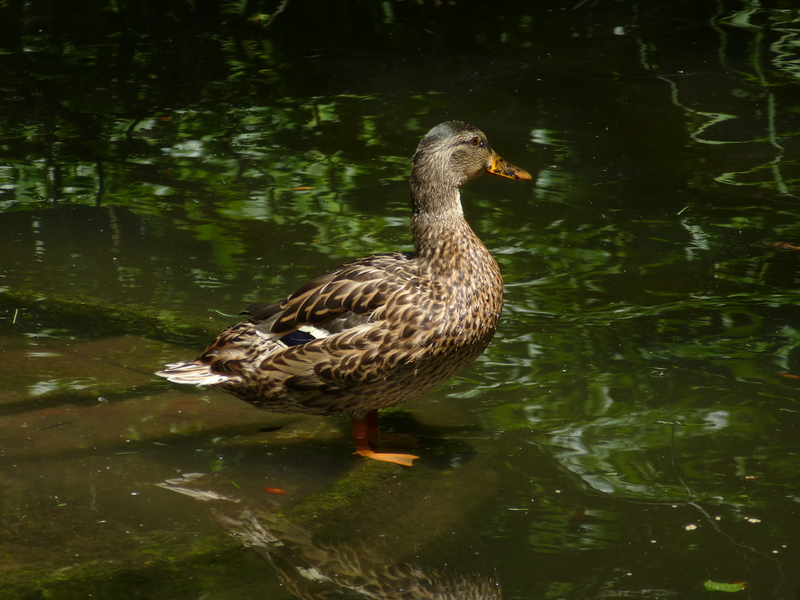 The mallard’s blue patch–the “speculum”–is a section of flight feathers called the seondaries. The Red-winged’s “epaulet” is a section of wing covert feathers. Yes, thanks from me, too! Thanks for sharing this journey with us. Wonderful stuff. >I wonder if she has any emotions about their departure? “Thank the Great Duck. They were driving me quackers”.